Deep frying makes our foods tasty and crispy but with greater health implications due to the use of oil. 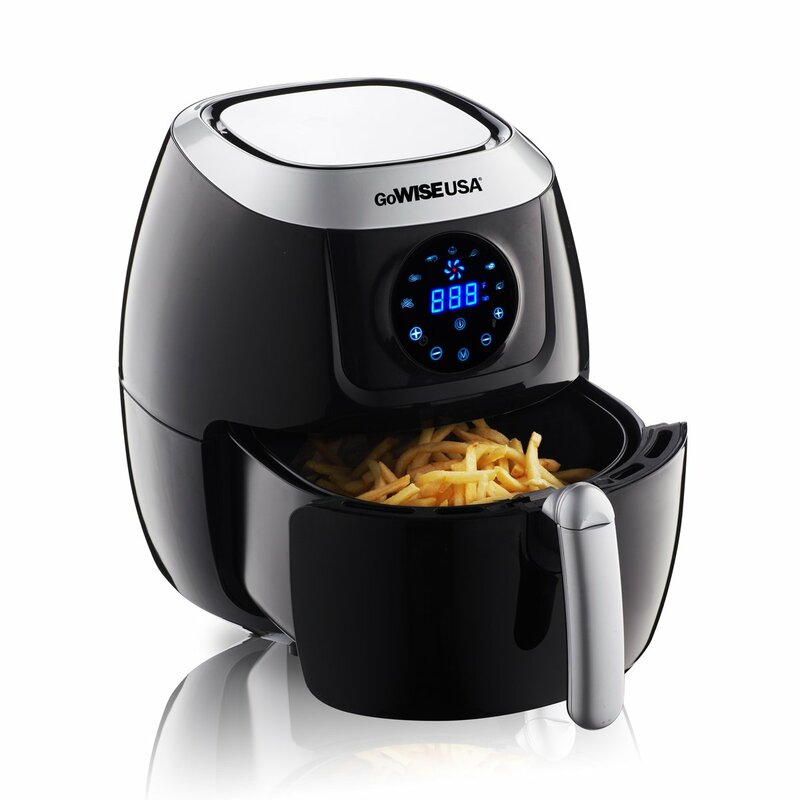 But with the GoWISE USA gw22631 5.8 Quart Air fryer, air is the new oil. Air fryers work by circulating hot air around the food at a high speed to cook with little or absolutely no oil but same crispy and delicious taste. Check out our GoWISE USA Air fryer GW22631 review to learn more about one of the best among these amazing fryers. The GoWISE USA 5.8-Quart Air fryer uses Rapid Air technology to circulate super-heated air around the food at a very high speed to provide an evenly cooked crispy and delicious meal, free from oil and the health risk that comes with it. This product from GoWISE, one of the leading manufacturers of kitchenware, comes in 3 colors, purple, red, and black, giving you variable options to complement your kitchen with the slick and beautiful air fryer. It weighs 14lbs, measures about 14.8 x 12 x 13.8inches in dimension and has a capacity of 5.8qt, enough to serve the whole family or even a party of a few people. Air fryers help us to prepare safe and healthy foods. 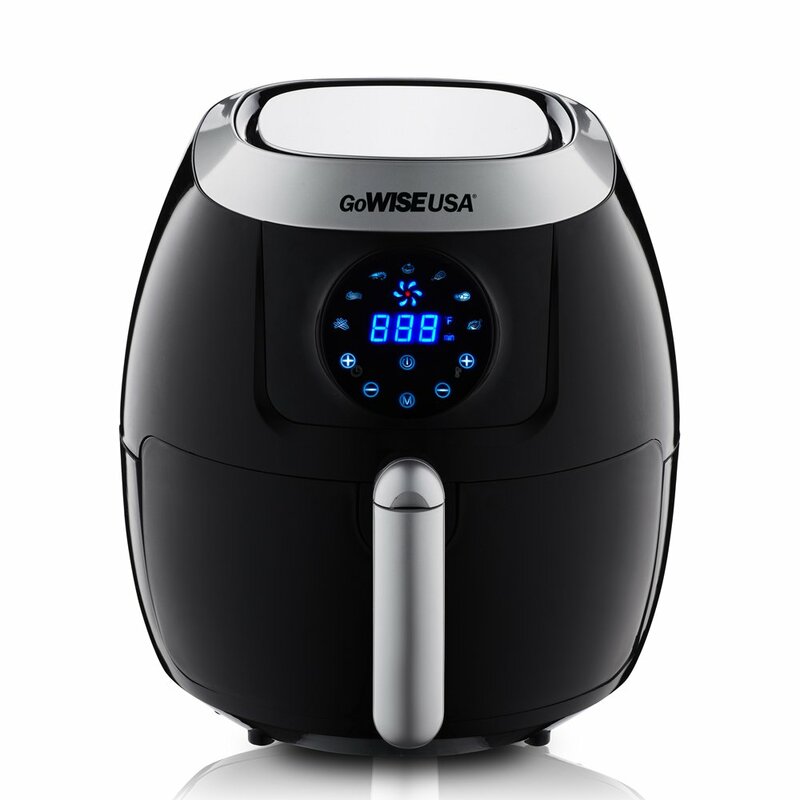 The GoWISE USA Air fryer GW22631 offers more. This air fryer is designed to simplify your safe cooking experience. It is very easy to use and clean. The GoWISE Air fryer has a simple digital touchscreen control with 7 preset options for cooking various types of foods. It features dishwasher-safe parts and an automatic timer to ensure your food never get burnt or overcooked. The GoWISE USA 5.8-Quart Air fryer has a lot of features that set it clearly apart from the rest, let’s check out those below. Capacity: With the GoWISE USA 5.8-Quart, you do not have to worry about size as the air fryer has a capacity of 5.8qt, enough to fry a whole chicken, feed the whole family, and even a small party at a single batch. Easy to Use: The Air fryer features a simple touchscreen control with 7 preset options for quick and easy use. It also features easily removable drawer that can be loaded and closed easily without issues. Temperature: You have a temperature range of 170F to as hot as 400F for your various cooking needs. Likewise, you could easily select from the 7 preset programs to cook the type of food you want. Easy to Clean: The pan and cooking basket are both removable and dishwasher safe. They could be easily removed after each cooking session to be properly cleaned with water. Versatility: The Air frying is very versatile and can also bake, grill, roast, sauté, steam and do much more apart from frying. This makes it a utility product that is able to perform variable cooking processes. Rapid Air Circulation: This technology ensures that the hot air is evenly distributed around the food. The result is an evenly cooked, perfectly delicious and crispy meal. Oil-free Cooking: The GoWISE USA 5.8-Quart is capable of producing a delicious, crispy and perfectly fried food with absolutely no oil. This helps to maintain a healthy lifestyle, devoid of the health risks associated with deep frying with oil. You may however purchase a few or more accessories on Amazon for other options. The air fryer is quite easy to use. Turn it on and set the temperature and timer. You can as well choose from the preset options depending on the food you’re cooking. The timer then shuts off after cooking is complete and you can then enjoy your delicious, healthy meal. Easy to use and clean due to the removable dishwasher-safe parts. Large capacity enough to serve the whole family. Cheap, when compared with other air fryers in its range. Fries come out crunchy and delicious. Cooks your favorite foods faster with no oil. Safe to use, due to the auto shut-off feature. Great at handling chicken, it comes out crispy and juicy. The basket is a bit hard to put back in after being removed. This is the only common issue among users. However, this can be solved by holding the handle up a bit, the basket can easily slide back in after doing this. Verdict – The GoWISE USA 5.8-Quart Air fryer is the perfect air fryer for a family kitchen. It offers a safe way to prepare your favorite dishes without oil. At a reasonable price, you get to enjoy the benefits of a large, modern air fryer and more. The GoWise Air fryer is definitely one of the best choices if you are looking for an air fryer with a large size, great quality, and an affordable price. It guarantees a great deal of value for your money. The risks associated with deep frying, far exceeds whatever pleasure and enjoyment the foods may seem to contain. With air fryers, foods are prepared faster, with absolutely no oil. Hence it is something that every family kitchen should have. When in search for the perfect air fryer for your home, there are things you may have to consider; The quality of the product, the ease with which you can use and clean it, the size as well as some other personal considerations. With all these in mind, the perfect air fryer is undoubtedly the 4th Generation XL Electric GoWISE USA 5.8 Quart Air fryer. It is simply an embodiment of quality and affordability.